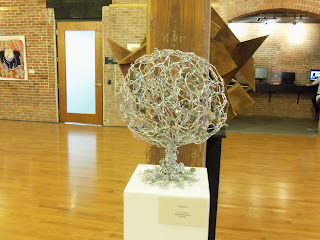 I am an art lover and.. itty bitty collector.. who enjoys discovering new shops and galleries. I am continually amazed at the wealth of artistic talent in this little corner of the state. And sometimes I am a bit embarrassed when I finally discover something that was right in front of me.. and I didn't notice. Studio B is such a place... The old saying that "the teacher will appear when the student is ready" is so true and applies to appreciation and inspiration as well. The current show featured at the North Hall Gallery at Montgomery County Community College is a visiting collection of member's works from Boyertown's Studio B. 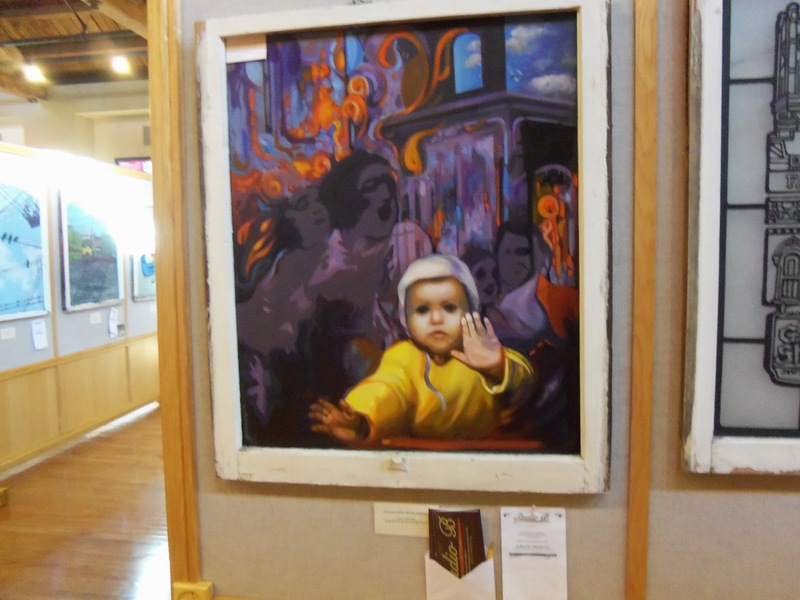 The show is Magnificent ....It is a mixed media exhibit that illuminates the wide range of talent in the Studio B's collective membership. Studio B serves as the home of the Arts and Activities Alliance, which is a committee of "Building a Better Boyertown (BBB)". Boyerown is a member of the Pennsylvania Downtown Center Main Street program. This program is funded by Pennsylvania Department of Community and Economic Development and supported by the Berks County Community Foundation (from their brochure). The show is quite large...I believe approximately 150 pieces are on display for your enjoyment and purchase. 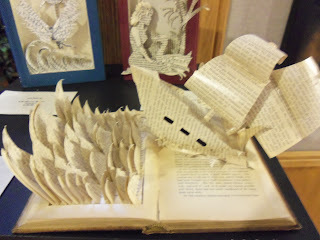 I was initially taken aback by this piece as I am a lover of books and to see one cut and shaped in this way made me pause. I then began to wonder how the artist saw this in their head and and then created this little masterpiece. 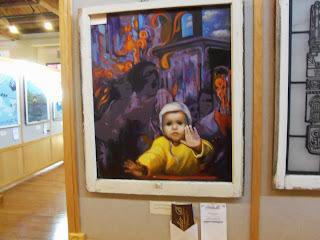 This piece is from the "Windows on Boyertown" display upstairs in the Gallery. It depicts the horror of the Boyertown Opera House Fire and the hope for the future..haunting and hopeful at the same time..and so beautiful in its interpretation and skill. This beautiful silver sphere has colored art glass(?) interspersed though out. It is stunning and would be the focal point in any collectors home. My photo does not do it justice. So get off your computer and get down to the Gallery to take in this wonderful exhibit... but it will only be here until December 14th....Gallery hours are 8:00 am til 9:30 pm Monday thu Thursday and Fridays from 8:00 am til 4:30 pm.